Splatball is the premiere MN paintball store and repair shop in Minneapolis, Minnesota! Splatball is Minnesota’s largest full service paintball store in MN with over 50 years of combined experience. Our techs have been factory certified/trained to work on hundreds of different paintball markers. Due to our outstanding service history, Planet Eclipse has even made us their North Central Certified Master Service Center for Minnesota. We know paintball. As one of the oldest paintball stores in the Twin Cities, you won’t find a more knowledgeable staff. Whether it’s a classic paintball gun that you need an o-ring for, or you’re looking for the latest Planet Eclipse gear, we have the inventory and the experience to provide you the best value for your money. Splatball also offers hydrotesting services for your compressed air paintball tanks. Our hydro service includes regulator removal and re-installation, hydro testing and a visual tank inspection by a licensed hydrotester. We can even install a new Ninja regulator and set the pressure to ensure the best performance from your paintball marker. Splatball has a growing selection of both new and used gear. Splatball buys, sells and trades gear! Stop in today to check out all of our latest and greatest merchandise and don’t forget to take a look at the used gun selection! 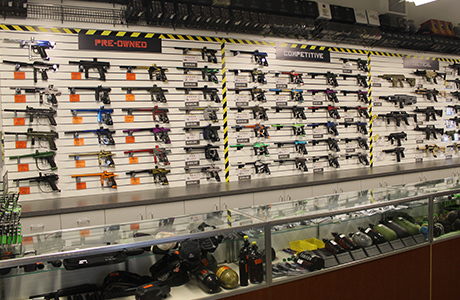 We work with over 30 different paintball equipment manufacturers in our store! Have questions about paintball gear and equipment? Learn more here. Looking for tips and advice on buying the best paintball gear? Check out our beginners’ guide. Check out our guide for advanced players.